Cynthia Walburn was born in Southern California and grew up in South Florida. She has resided in North Florida for over twenty years and currently divides her time between Jacksonville and Fort Lauderdale. 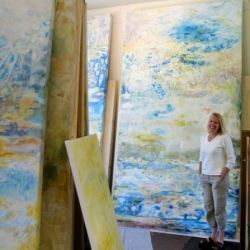 The sunlight and tropical landscape of South Florida is an obvious influence in her work. She derives her inspiration from nature but especially the beaches, marshes, and springs of Florida. Most of her paintings incorporate the quality of light reflecting off or through water. Formally trained in the field of architecture and interior design, her love for painting and drawing has evolved and expanded over the course of 30 years. She first realized her inner artist as a child, and experimented with many forms of applied and fine arts before realizing her full passion as a painter in the early 1990s.